Many of us have expressed a desire to have a show of our quilts for our friends and families. Our resources, in terms of woman power and finances, are not conducive to a free standing show of our own. The Nimble Thimbles Quilt Guild has a long established show, AUNT HET (in Fountain Inn). The show chair, Ruth Bartholomew, spoke at our last meeting to invite us to enter our quilts for this year. There is a possibility that, in the future, we may even have our own Modern Quilt category. This is an annual show with NO ENTRY FEE and is not juried or judged. Ribbons are awarded by viewer's choice votes. Entry is online and very convenient. To make it even more convenient, I (Faye) will pick up quilts from and return your quilts to a convenient drop spot. Please consider participating, this is a great opportunity for us to generate public awareness of our guild and modern quilting. Thank you Paige Alexander for coordinating our first GMQG small quilt challenge (up to 36"). The theme was Black, White with a POP of color. And, we cannot leave out IMAGINATION as the operative word in the design aspect of this quilt challenge. Well, imagination was what ten (10) entries delivered. Take a look below at the varied designs. So that the entrant remained anonymous, our group voted by the number attached to the quilt. How would you vote? 1st Place-Paige Alexander #6 entitled "Cursive"
2nd Place-Pam Lobuck #8 "Bubbles in Space"
3rd Place-Cheryl Brickey #3 "Crush with Eyeliner"
4th Place-Carol Alperin #5 "Sinus Rhythm"
The winners received gift certificates to Bernina Sewing Center and a beautiful handmade prize ribbon by Paige. Overall, the challenge was a success. Paige extends a thank you to all the entrants and to our group participation in the voting process. We had a total of 28 in attendance welcoming one new member. Cindy Lammon organized a Sew-in Day on July 29th. It was productive, it was fun, it was rewarding. 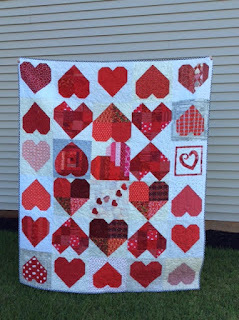 One of the projects accomplished on this day was organizing and sewing the heart squares together. If you recall, in June, our group was challenged to make a heart quilt square for the #QuiltsforPulse sponsored by the Orlando MQG group reaching out to families, friends, first responders impacted by the recent Orlando shooting. Amazing!!! You can feel the heartbeats and heart warmth in this quilt. In addition, we extend special acknowledgment and thanks to Carol Alperin for her custom quilting on this piece with meandering hearts to complement the design and to Cindy Lammon for sewing the binding to complete the project. Our group appreciates you both for your time and talent on this special quilt. Cindy is working to schedule our next Sew-in Day for the end of October, so we will provide you that date soon. August Block of the Month needs a little bit of introduction. GMQG mission this year is to make children's quilts for the Children's Hospital at GHS specifically to children in an abusive situation. A new program they are beginning is pet therapy where traumatized children have opportunity to enjoy the love of a pet. Faye Jones, thinking outside the box, came up with a creative idea for the August Block of the Month. It is pet scarves for the dogs to wear when coming to visit the kids. Here is a sample she provided. July Block of the Month was Wonky Cross Block Squares. Thank you to all those who brought in a quilt square for this month. We had some fantastic color pops!! As we continue to add blocks of the month, remember you can participate in the current month block or go back to one of the previous months. We appreciate each and every contribution as well as quilt making experience to this worthy and impactful cause. MQG Webinars - both upcoming and past quilt webinars are posted on the Modern Quilt Guild website . This is a way to learn technique, trends and so much more. Attend a quilt show. Several are listed below in Upcoming Events. GMQG - we want to begin working on our Quiltcon East Charity Quilt on September 10th, prior to our 1:00 - 3:00 pm meeting time. Valerie Kasten is working to coordinate. Right now, she is looking at 10:00a.m as the gathering time. More details will be forthcoming. We had an impressive selection of quilt technique and designs this month. Marilyn,you were missed at our meeting, so I know you will enjoy seeing all of these. We wish you a speedy recovery and look forward to you resuming your perfect attendance next month ;-). Nicole McClelland- quilt for a newborn baby boy....isn't he lucky! Quilting in the Pines sponsored by the Sandhills Quilt Guild is September 23 – 24 in Pinehurst, NC (Quilt submission deadline August 30). 2016 Aunt Het Quilt Show sponsored by Nimble Thimbles Quilt Guild, October 1-2. (Quilt submission deadline September 2). Ashville Quilt Show September 30, October 1 & 2 (Quilt submission deadline August 1). On September 10th, at Bernina Sewing Center from 1:00-3:00 pm, we will be featuring a trunk show with Cindy Lammon. Many of you follow her blog at Hyacinth Quilt Designs. In addition, she has authored four quilting books. You are guaranteed to be inspired. We will also be announcing new candidates for guild office positions. And, at 10:00 a.m., same date, we are hoping to start working on the Quiltcon East Charity Quilt. We will be sending more information for you to begin planning. This Saturday, the 13th, at our August meeting, we are having our 1st GMQG quilt CHALLENGE! Black and White with a POP of one color! We hope you will plan to join us and better yet participate. Paige Alexander has put a quilt challenge to our group with a theme of Black/White with a pop of one color. Your finished mini quilt can be any size or shape up to 36" x 36". For more information refer to Paige's post at Greenville Modern Quilt Guild-May 2016 as well as to read her newest additions. Remember to bring your finished project enclosed in a bag, so the entries will be anonymous until after voting. If you have a name or a title for your quilt, you can pin it to the quilt (optional). All entrants will have the opportunity to share about their quilt and design process. Also, do not forget to bring your July Block of the Month which is Wonky Cross Block Squares and any other Show and Shares you would like to bring. It's going to be a fun time. Come join us! We look forward to seeing you.